Shane Lyons is an American chef, restaurateur and actor. 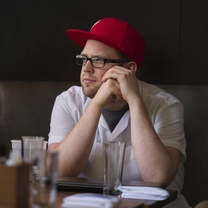 He and partner Nick Lovacchini opened their New York restaurant, Distilled, in June 2013. His parents were both chefs and he was working with a knife at age five. He began his culinary career at age 12, when he found his first baking company, the first of many culinary ventures. "Soft scrambled eggs, West Coast uni, and caviar. Simply an amazing dish. The layers of fresh ocean flavor pair perfectly with the soft scrambled hen's egg. Chase it with a tableside smoked whisky cocktail and the mouth party begins." "Sturgeon with caviar and fresh tagliatelle. It's the epitome of simplicity combined with technical excellence. A fine showing of Markus' talents." "In NYC, where $13 can disappear with a latte and muffin, at Puffy's $13 gets you stuffed with a great sandwich overflowing with prosciutto, mozzarella, olive tapenade, and hot peppers." "While pork belly has become ubiquitous in NYC, it's born anew at Momo Sushi in Bushwick."